I've just got the initial Simulation and Testing framework working with JUnit integration :) Although still lots to do. It allows Simulations to be run, with tests, for complex apps that involve rules, workflow and event processing all working together over time. This really shows of the Business Logic integration Platform (BLiP) concept and why people should be thinking about using Drools. Rather than the more traditional three different standalone engines with poor integration and totally different approaches, forcing you into a "process oriented" or "rules oriented" world. When testing your business logic unit tests are not ideal. What you really want to be doing is testing the behaviour of your business logic, to do this you need to execute it in a Simulation environment. Drools 5.0 already has basic simulation and testing in the Guvnor QA tab, however it is not time aware and is specific to rules. By time aware I mean that it creates a session, inserts the facts and just lets it run and then checks the results at the end. For simulation we need to be able to execute specific actions at specific points of time while being able to assert on the engine data (inserted objects, globals and process variables, etc) or the engine state itself (agenda, process instances, etc) at given points in time. The Simulator runs the Simulation. The Simulation is your scenario definition. The Simulation consists of 1 to n Paths, you can think of a Path as a sort of Thread. The Path is a chronological line on which Steps are specified at given temporal distances from the start. You don't specify a time unit for the Step, say 12:00am, instead it is always a relative time distance from the start of the Simulation. Each Step contains one or more Commands, i.e. create a StatefulKnowledgeSession or insert an object or start a process. All the steps, from all paths, are added to a priority queue which is ordered by the temporal distance, and allows us to incrementally execute the engine using a time slicing approach. The simulator pops of the steps from the queue in turn. For each Step it increments the engine clock and then executes all the Step's Commands. Commands can be grouped together, especially Assertion commands, via test groups. 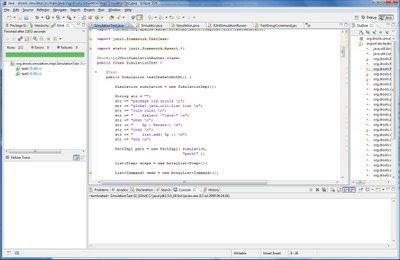 The test groups are mapped to JUnit "test methods", so as they pass or fail using a specialised JUnit Runner the Eclipse GUI is updated - as illustrated in the above image, showing two passed test groups named "test1" and "test2". Using the JUnit integration is trivial. Just annotate the class with @RunWith(JUnitSimulationRunner.class). Then any method that is annotated with @Test and returns a Simulation instance will be invoked executing the returned Simulation instance in the Simulator. As test groups are executed the JUnit GUI is updated. While the identifier manipulation Commands and Command adapters add a fair amount of verbosity to the api, they also create a very flexible Simulation environment. Tooling will be added that will hide this verbosity and reduce complexity, making it much more palatable. While it all now works from an API perspective and JUnit integration, building a Simulation programmatically can be a bit verbose. So my next task is to update the existing Command XML, as discussed here, to support the simulation, so that simulations can be defined purely in XML. At the same time we are working on an excel/open office front end to allow simulations to be defined with a Tabular metaphor which I hope should prove very popular. Awesome, i will try to add this to my PoC to provide simulation with an UI.